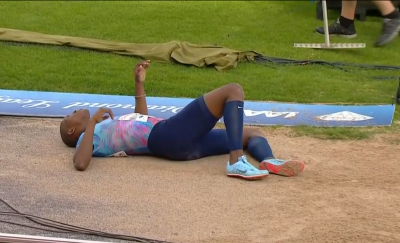 Since the Kenyan and US Trials are next week, some top stars were absent but there were some stellar performances and a couple of thrilling upsets at Sunday’s BAUHAUS-galan in Stockholm, the final meet before the Diamond League goes on a two-week break. 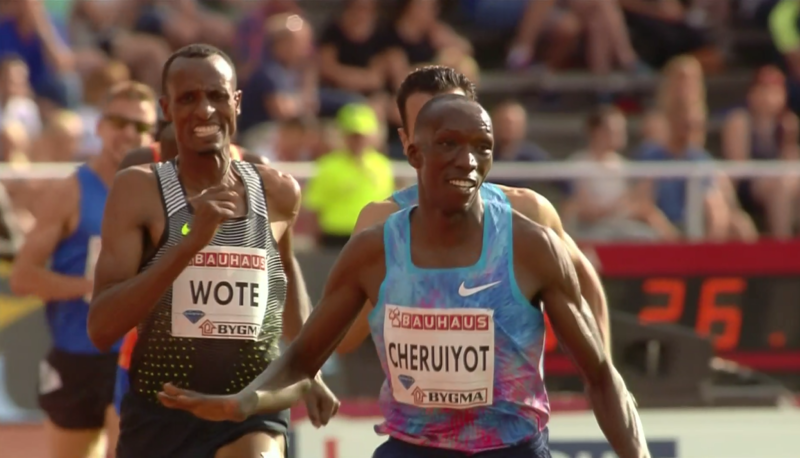 Kenya’s Timothy Cheruiyot impressed with a 3:30.77 world leader to win the men’s 1500 as Asbel Kiprop took a big step in the right direction by running a season’s best of 3:33.17. In the sprints, Andre De Grasse kept rolling with his third straight Diamond League victory, running a heavily wind-aided 9.69 in the 100 (worth 9.88 in still conditions). Though Russia’s Mariya Lasistkene (high jump) and South Africa’s Luvo Manyonga (long jump) kept their unbeaten seasons alive, not all the favorites survived as Croatia’s Olympic champ Sandra Perkovic saw her 16-meet win streak snapped in the women’s discus, losing to Cuba’s Yaimi Perez. We recap everything below, beginning with the distance races. If you just want results click here. *Video highlights only here. 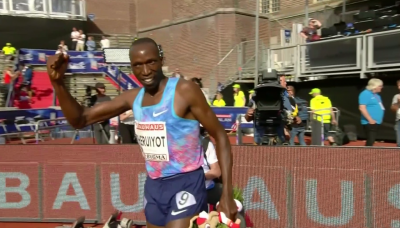 Cheruiyot did not make Kenya’s Olympic team last year, but he’s been in great form ever since, winning last year’s Diamond League final in Brussels and earning another DL victory this afternoon in Stockholm with a world-leading (and personal best) 3:30.77. The pace was quick, with the rabbits passing 400 in 55.06 and 800 in 1:52.43 with Morocco’s Abdelaati Iguider leading and Bahrain’s Alsadik Mikhou, who entered as the world leader, running in second. 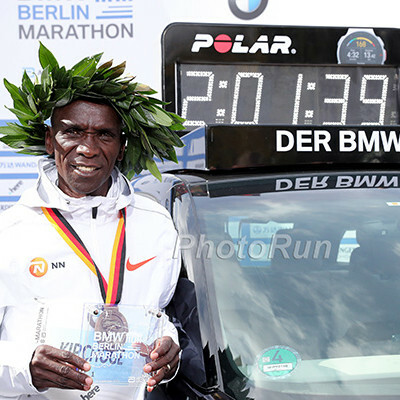 Cheruiyot, David Torrence, Asbel Kiprop and Aman Wote rounded out the lead pack of five men. 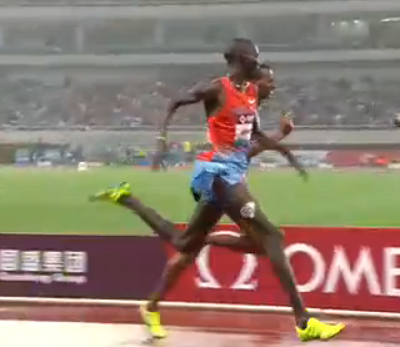 At the bell, it was the same order, with Cheruiyot and Kiprop moving to the outside into position to strike. And indeed, with 300 to go, Cheruiyot took off and put in a massive surge and by the end of the backstretch, he led by a couple of meters. The sub-3:30 man Wote did close the gap on the final turn, moving into second, and Mikhou was still there too as they entered the homestretch. But with 100 to go, Cheruiyot hit the gas again, and this time it was definitive as he destroyed Wote and Mikhou over the home straight to win in a quick 3:30.77 on a windy day in Stockholm. 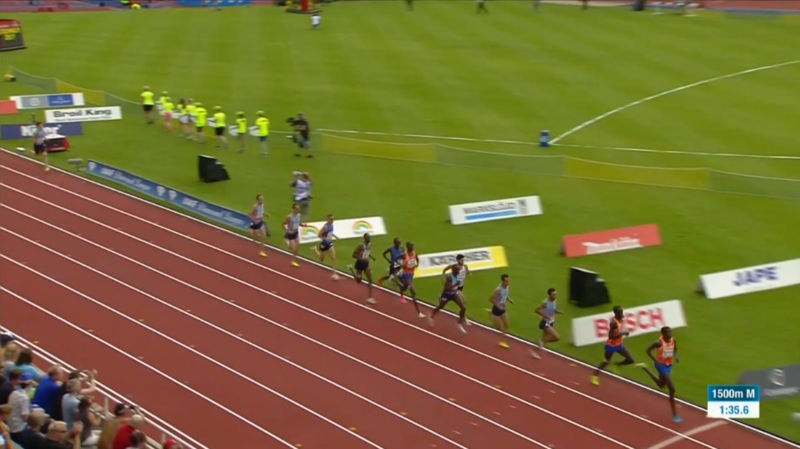 Mikhou just missed the PR he set last week in Hengelo, running 3:31.49, while Wote was third in 3:31.63. Kiprop was never a factor for the win over the final 200, but he looked much improved throughout and ran a season’s best of 3:33.17. Further back, Norway’s 16-year-old Jakob Ingebrigtsen ran an impressive 3:39.92 — a PR by 2.5 seconds — but running against the world’s best, he was outclassed and finished last. This isn’t exactly breaking news, but Kenya has shown an impressive combination of top-end talent and depth this year in the men’s 1500 as three different men have now won Diamond League events in 2017 — none of them named Asbel Kiprop. 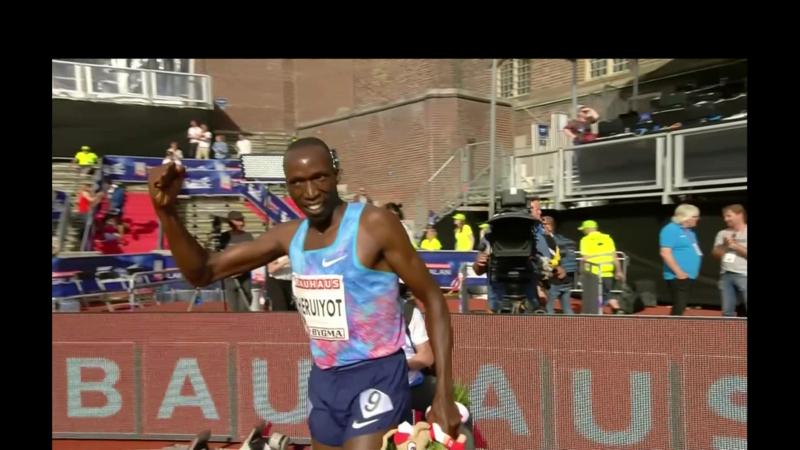 Elijah Manangoi led a Kenyan 1-2-3-4-5-6 in Doha, Ronald Kwemoi was the winner in Eugene as Kenyans went 1-2-3-4 and now Cheruiyot has a win in Stockholm. Cheruiyot’s run today was mighty impressive as he ran away from an in-form Mikhou and clocked a world leader despite windy conditions (the wind in the men’s 100, run just after the 1500, was 4.8 m/s). Kenya’s success could carry all the way into the World Championships as Kenya has four slots available with Kiprop receiving a bye as defending champion. Kiprop said he was only 40-45% fit at Pre when he finished last while battling the flu. He upgraded that to 50% before Stockholm and said that he hopes to be at 70% for the Kenyan trials next week. Kiprop also said that he needs to lose some weight after getting a late jump on training this year. Coming into the meet, we thought anything under 3:35 would be a solid run for Kiprop today. Though he didn’t contend for the win, Kiprop did look good in running 3:33.17 for fourth (faster than what Matthew Centrowitz ran at Oxy last month), and if we were a 1500 runner, we’d be worried about Kiprop right now. Remember, the 1500 at Worlds doesn’t start until August 10; that’s almost eight weeks from now. For a man of Kiprop’s talent, if he stays healthy, getting from 3:33 shape to gold-medal shape in two months is very doable. And Kiprop has shown repeatedly that, if he gets his tactics right, he’s basically unbeatable at the major championships. We’re excited to see what he can do at the Kenyan trials next week. In recent weeks, 16-year-old Jakob Ingebrigtsen has gotten a ton of press – and for good reason – he is a 3:56 miler after all. But take a look at how far back he was just 700 meters in today’s race. Ingebrigtsen deserves a ton of props for somehow being able to run 3:39 all alone and not packing it in. Running 3:56 for the mile at age 16, as Ingebrigtsen did on Thursday in Oslo, is remarkable. But we should also appreciate the professionalism and consistency Ingebrigtsen has delivered at such a young age. On May 27, he ran 3:58 in Eugene; now he’s run 3:56 and 3:39 within a span of four days. That’s three PRs in three different countries in just over three weeks. Between the travel and pressure of racing on the Diamond League circuit, it would have been totally understandable if Ingebrigtsen flopped, particularly today, when he was running alone by the halfway mark. But the Norwegian has met every challenge. What a runner. More discussion: Ingebrigtsen: 3:39 in Stockholm! 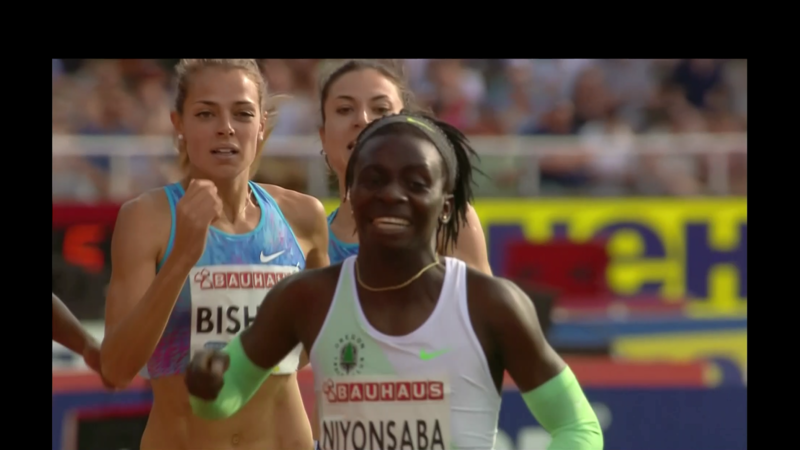 Women’s 800: Francine Niyonsaba kept the show rolling in Sweden as she got the win in 1:59.11. The rabbit Jenny Meadows got the field out in a quick 56.81 with Niyonsba behind her and Melissa Bishop on Niyonsaba’a inside. Meadows kept going trying to hit 500, but the field got impatient behind her as she was slowing and Niyonsaba passed Meadows just before 500m (1:12.3). Niyonsaba led down the backstretch but the pace continued to slow as much of the field was in contention as they hit 600 in 1:28.83. Niyonsaba hit the homestretch in the lead but the race was far from settled as a bunch of runners were on her heels. However, Niyonsaba separated from the field over the final 100m (much like how Semenya normally separates from Niyonsaba or Wambui) to win in 1:59.11. Lovisa Lindh of Sweden closed the best of everyone else, and she finished second in 1:59.41, coming up short of the Swedish record of 1:59.20. Selina Buchel was third, Melissa Bishop 4th, and Olha Lyakhova 5th as six women went sub-2:00. 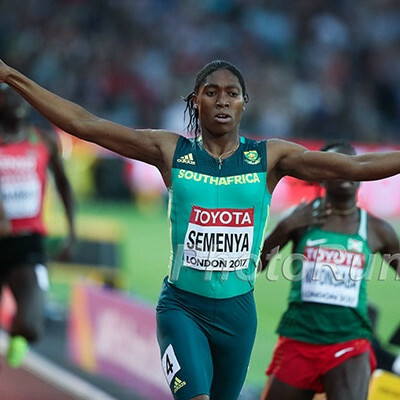 It has to happen at some time, but since the start of the 2016 outdoor season, no one outside of the big three in the women’s 800 — Caster Semenya, Margaret Wambui and Francine Niyonsaba — has beaten one of the big three. That streak continued today even though Niyonsaba’s run wasn’t as impressive as her 1:58.18 in Oslo three days ago. Despite the absence of Olympic champion Conseslus Kipruto, Morocco’s Soufiane El Bakkali, who was fourth in Rio last year, wanted to push the pace and he was close behind the rabbits when they hit 1k on sub-8:00 pace (2:39.02). By that point, El Bakkali led by 15 meters and even after slowing over the next kilometer (5:24.98 at 2k), he was well clear of the field. The more interesting battle was for second place, where 19-year-old Eritrean Yemane Haileselassie was trying to hold off France’s Yoann Kowal and Kenya’s Nicholas Bett. Kowal mounted a serious challenge over the penultimate lap, but faded badly to 9th place by the finish as he appeared to miscount his laps. After the hot early pace, no one closed particularly well as El Bakkali held on to win in 8:15.01 to Haileselassie’s 8:18.29. El Bakkali’s time was the slowest to win on the Diamond League circuit since this meet two years ago, when the field was similarly depleted by the Kenyan World Championship trials. Considering Kipruto, the world’s best steepler, still has never broken 8:00, it was bold of El Bakkali to go out so quickly and, predictably, he slowed considerably over the second half of the race. However, the Moroccan did show confidence in his ability and toughness over the final kilometer, and his performances the last two weeks have stamped him as a medal contender in London. 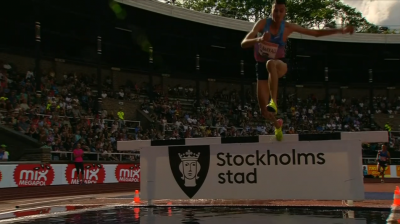 Few countries have dominated an event like Kenya has dominated the men’s steeplechase, and when the top Kenyans are absent, it really drags down the quality of the event, as the results in Stockholm in 2015 and 2017 have shown. 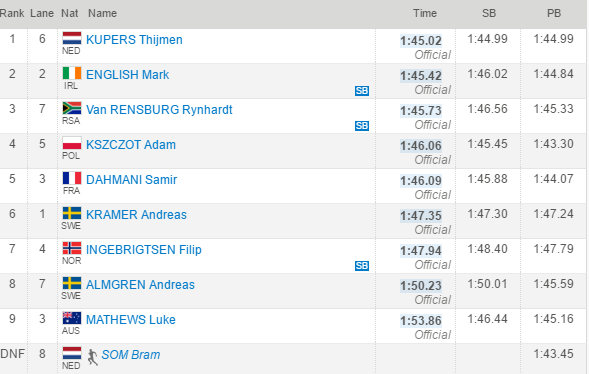 After failing to break 1:45 in his first 25 years on Earth, the Netherlands’ Thijmen Kupers almost did it for the second time in eight days, following up his 1:44.99 last week with a 1:45.02 victory over a solid field in this non-Diamond League event. Ireland’s Mark English and South Africa’s Rynhardt van Rensburg didn’t PR, but both men locked down the World Championships standard of 1:45.90. Poland’s Adam Kszczot, who won in Rome last week, was only fourth. 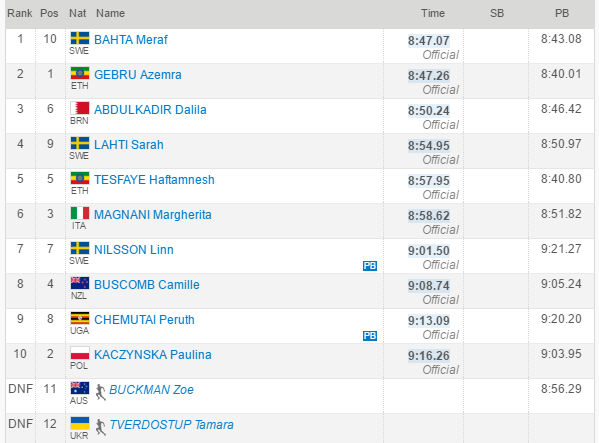 The Eritrean-born Meraf Bahta, an Olympic 1500 finalist last year for Sweden, did most of the work in this one and was ultimately rewarded with the victory in 8:47.07. The pace went out fairly quickly (2:52.09 for the rabbits at 1k), and by that point, the lead group had dwindled to five women, with Bahta the first racer behind the rabbits. 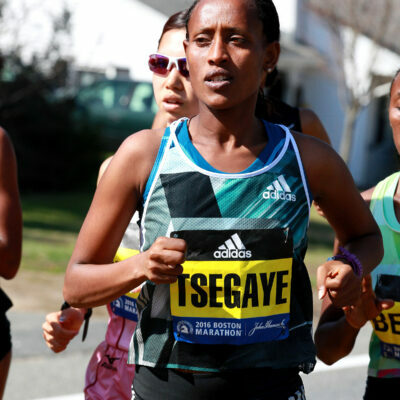 But Bahta would back off over the next kilometer, and at 2k (5:50.9), there were still five women up front, including Ethiopia’s Azemra Gebru and Haftamnesh Tesfaye, Bahrain’s Dalila Abdulkadir and another Swede, Sarah Lahti. It remained a close race at the bell, with Bahta, Gebru, Abdulkadir and Lahti all still in it, but once they entered the final lap, Bahta finally made her move and the lead group quickly strung out. Gebru was the only one to follow her, and with 200 to go, they had separated with Bahta unable to drop her rival. Gebru then went by coming off the final turn and looked as if she was about to steal the race, but Bahta responded on the inside and took the lead back with 40 meters to go. From there, she held on to the line to earn a well-deserved win in 8:47.07 to Gebru’s 8:47.26. This was a non-DL event. For the first two-thirds of the men’s 100, it was a very tight affair between the Ivory Coast’s Ben Youssef Meité and Canada’s Andre De Grasse but De Grasse had a turbo boost and pulled away in dominant fashion to win decisively. The time then flashed on the scoreboard — 9.70 (adjusted to 9.69) — but the wind was well over the legal limit at 4.8 m/s. Meite ended up being a distant second in 9.84. 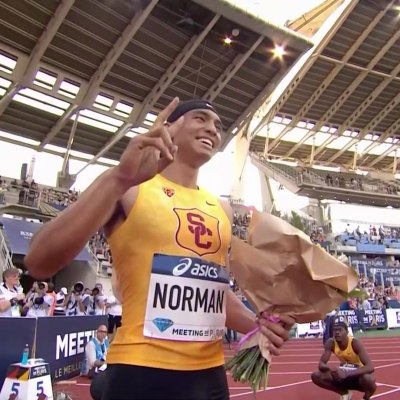 The 9.69 tied for the 4th-fastest 100m ever run under any conditions. Adjusting for the wind using Jonas Mureika’s wind/altitude conversion calculator, the run today was equal to a 9.88 with no wind at all which is exactly what Christian Coleman’s 9.82 at NCAAs (+1.3 m/s wind) converts to. De Grasse crushed the field the final 30 meters of this one and showed a gear he hadn’t shown this year. Three days ago in Oslo he beat Meite by only .02. Today Meite was .15 behind him. Though the Hayward Field track is known as one of the fastest in the world, Coleman also ran 9.82 this year. Stockholm is not known for being fast, but regardless of who you think is #1 in the world this year at 100m, Bolt is not going to have it easy for his swan song in London. After two false starts, this race had only five starters, but it was still a good race as Olympic silver medalis Orlando Ortega and world champ Sergey Shubenkov were close throughout. Shubenkov had the lead over hurdle nine and was still slightly ahead over hurdle 10, but a strong close and a good lead gave Ortega the win by .01 in a wind-aided 13.09. Ahoure was robbed of a win on Thursday in Oslo after Dafne Schippers’ result was allowed to count despite a blatant false start. With no Schippers in the field today, Ahoure got redemption, but she had to work for it as Canada’s Crystal Emmanuel closed well in lane 2 and almost nipped her at the line, running 22.69 to Ahoure’s 22.68. 21-year old Steven Gardiner, who opened his season with a blistering 44.26 on April 6 and then won the DL in Doha, remained undefeated on the year as he won the men’s 400 in 44.58. Running in lane 4, Gardiner started slow as Botswana’s Baboloki Thebe (44.22 pb), the 20-year old who won in Oslo on Thursday, got out hard in lane 5. However, Gardiner really picked it up and quickly ate up the deficit and then some as they approached the second turn. In the final 100, Gardiner held of Thebe who was second in 44.99. Former Florida State runner Kevin Borlee was third in a seasonal best of 45.47. 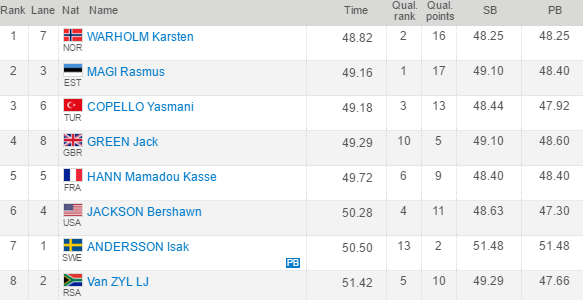 21-year-old Karsten Warholm made a name for himself on Thursday, winning on home soil with a 48.25 world leader in Oslo. He showed that was no fluke as he led every step of this one, holding the field off on the home straight to take his second DL win in four days in 48.82. The South African Manyonga entered riding a streak of four straight competitions where he’d leaped at least 8.60 meters, but he could “only” manage 8.36 meters today despite a healthy 3.3 m/s tailwind on that attempt. The wind turned later in the competition however (Manyonga jumped 8.20 into a 3.7 wind and 8.28 into a 1.0 wind on his last two jumps) and he would go no further. 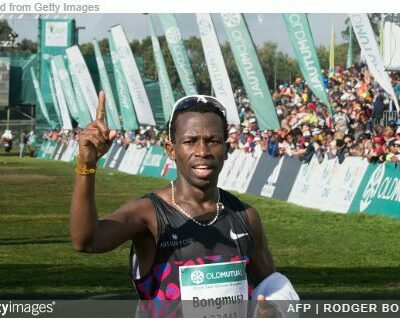 Manyonga stayed down after his final attempt and had to receive medical aid. The extent of the damage was not clear, but we hope it’s not serious as Manyonga has been putting together one of the best long jump seasons in years. 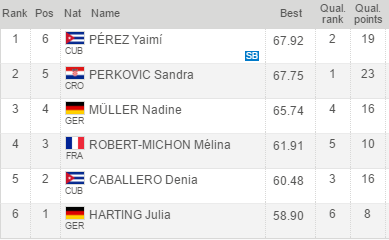 Perkovic’s win in Oslo on Thursday was her 16th straight, tying the longest win streak of her career, but once again #17 proved too much as Perez threw 67.92m to Perkovic’s 67.75m, handing Perkovic her first loss since the 2015 World Champs. Since the start of 2013, only three women have won a Diamond League discus event: Perez has two wins, the U.S,’s Gia Lewis-Smallwood has one and Perkovic has won the remaining 28. How good has the Russian Lasitskene, the reigning world champ been this year? Well not only has she won all 13 of her competitions, but she’s won her three Diamond League events (Eugene, Rome, Stockholm) without missing a single bar. That’s not to say that she hasn’t had any misses, but rather she has done enough to win all three competitions without recording a miss. Her win streak continued today as she had a clean sheet through 2.00 meters (the only woman over 2.00) before missing three attempts at 2.06, which would have been a PR and put her in the top five all-time. 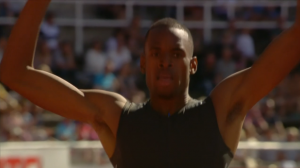 Sweden’s Daniel Stahl won in Oslo on Thursday, but he couldn’t do it again on home soil in Stockholm as Dacres, the runner-up in Oslo and 2017 world leader, turned the tables on him, throwing 68.36 to Stahl’s 68.13. In years past, Dacres had managed big throws in his native Jamaica or North America but hadn’t competed much on the DL circuit. But in the past four days, he’s gone 67.10 in Oslo (2nd place) and now 68.36 in Stockholm — his first 68-meter throw outside of Jamaica/USA. Cuba’s Yarisley Silva won in Oslo and was favored to win again here in Stockholm, but she could only clear one bar (4.55m) and wound up fifth. Meanwhile, New Zealand’s Olympic bronze medalist Eliza McCartney, who no-heighted in Oslo, was only marginally better in Stockholm as she cleared the opening height of 4.20 but could go no higher and finished eighth. That left a void at the top, which Buchler filled by clearing 4.65 and defeating Sweden’s Angelica Bengtsson on countback. 4.65 was the lowest winning bar since Greece’s Katerina Stefanidi won with 4.57 in Birmingham in 2014.